You've heard me rant and rave about Mana Pools a couple of times. Words fail to describe the wonder and ethereal beauty of the place...but somehow so do the majority of photos taken there. Why is that? Is it because photos are 2D, and the Mana Pools experience is immersive, holistic and overpowers all the dimensions you perceive and the senses you use to perceive them?? Is it because you feel so insignificant in this wilderness, that you actually feel that God made it too beautiful to capture perfectly on camera, so that you feel you have to return regularly to drink the beauty and the wilderness in?? The other problem is that I actually visit this place for the wonderful wildlife encounters you can have here, as well as the total disconnect from modern life and the rat race. The best time to do this is the dry season - meaning (like in most of Southern Africa) that the skies will be cloudless most of the time. This year, I hosted a Wild Eye photo safari to Mana Pools in early September, a little later than my previous visits...for one thing there was a LOT of haze during the first 2 days due to incessant fires on both the Zimbabwean and Zambian side of the Zambezi river. Luckily, a constant wind on our 3rd day blew all the haze to someplace far away, and we had 2 more days of nice clear skies. Our final afternoon, though, was a real treat for the landscape photographer that's hidden beneath all this wildlife bravado...high clouds. Those of you who photograph sunrises and sunsets regularly know that high clouds are often an indicator of a wonderful sunset. The problem in Mana is that the sun sets behind the mountains on the Zambian escarpment, so you have no idea whether there are clouds on the distant horizon that will block those last magical rays of red sunlight that inflame high clouds like a rampant viral outbreak. During our last drinks stop, some of my guests wanted to photograph the lovely trees on a certain stretch of the river close to the Trichilia campsite with wide angle lenses, and I was only too happy to join them. Like it so often does, the light on the high clouds looked to pop, then fizzled...and just as I was beginning to pack up the tripod - the sunset exploded! Now, like I said earlier, I'd never really been able to get a composition that did the trees and all the elements of the landscape justice. For me, a landscape photo taken in Mana Pools needs to convey a real sense of the place...the massive trees (and I do mean massive), the barren earth with its termite mounds sparsely spread between those trees, an elephant (okay for a wide angle landscape shot this would be a long shot), the sparkle of the broad waters of the Zambezi river, and the rising escarpment in Zambia...the ideal Mana Pools landscape photo needs to take you there, especially people who have been there. 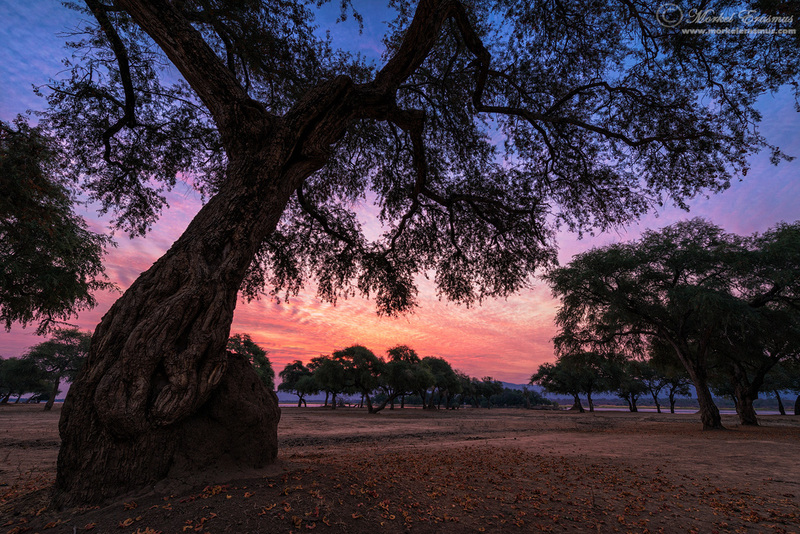 It doesn't matter if you went once as a child 80 years ago or if you fervently make a near-religious pilgrimage to Mana, once you've been there, an ideal Mana Pools photo should transport you there in an instant. During this particular sunset, I found a couple of compositions that I feel does this. This photo is the result of manually blending 3 different exposures to get the look and feel that I was after. I wanted it to convey the detail my eye saw in the tree trunks and the distant landscape, while still capturing that magical sunset colour and light. By using the main tree as a frame for the image, I think I have conveyed something of the size of these trees: like Ents of Middle-Earth the rise up and watch over the floodplains. 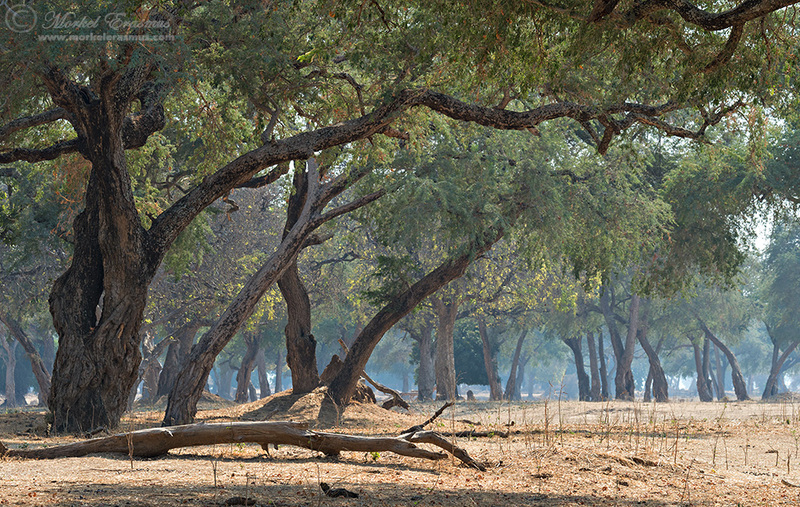 These trees are called Faidherbia Albida, or Winterthorn, or Ana trees...and the pods that lie on the ground are a staple food in the dry months for all the herbivores that roam these floodplains. I think I will probably have to return and get a better one...well, I am using that as an excuse as I really will return. Every year, I will return, as long as I am able to do so...and I will try and share the wonder of this place with as many people as I can, as long as I am able to do so. Thank you for reading my ramblings. Have a blessed day, friends! This is a fantastic image! Thanks for sharing. P. S. I came to your blog from NSN. Thank you very much, Kartik! Fantastic photo, I like the composition, no need to refo anything! I did not know you used a DF too, do you still use it frequently? I have one too, keenly waiting to see if Nikon brings out an anniversary edition.